1. Preheat oven to 190ºC, gas mark 5. Line two baking trays with baking parchment. 2. Whisk the Stork with the sugar until pale and fluffy, then whisk in the egg yolk. Gradually whisk in the flour and mixed spice and bind to a dough. Cover with cling film and chill for 30 minutes. 3. On a floured surface, roll out the dough to the thickness of a £1 coin. Using Waitrose Halloween Creepy Cookie Cutters including ghosts and pumpkins, cut out about 20-24 biscuits and place on the baking trays. 4. 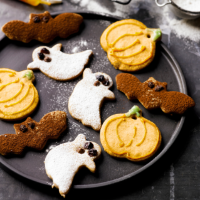 Cut the raisins into quarters and use as eyes for the ghosts, use the chocolate chips as eyes for the bats and bake for 12-15 minutes until just golden. Transfer to a cooling rack and leave to cool. 5. To decorate, dust the ghosts with icing sugar and the bats with cocoa powder. For the pumpkins, use the green icing for stalks and the orange icing to outline the pumpkin shapes.